Under a new name: Elysium. 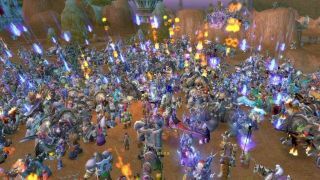 Previously on Behind the Emotes: The Nostalrius Story—fed up of waiting for Blizzard to make good on its apparent willingness to support legacy World of Warcraft servers, the team behind 'vanilla' WoW server Nostalrius have decided to relaunch it under a new name, Elysium. That's a a bit of a simplication: they've shared the code and whatnot with existing legacy project Elysium, which is now set to relaunch but with the Nostalrius database included. Saturday December 17 at 5pm UK time/12pm EST is when we can expect that to happen, and you've played either Nostalrius or Elysium in the past, your character/s should be there when you log in.